(Nanowerk Spotlight) The remarkable properties of some natural materials have motivated many researchers to synthesize biomimetic nanocomposites that attempt to reproduce Nature’s achievements and to understand the toughening and deformation mechanisms of natural nanocomposite materials. One of the best examples is nacre, the pearly internal layer of many mollusc shells. It has evolved through millions of years to a level of optimization currently achieved in very few engineered composites. 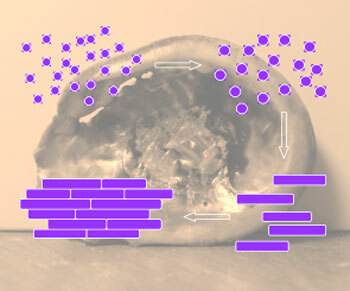 Preparation of artificial analogs of nacre has been approached by using several different methods and the resulting materials capture some of the characteristics of the natural composite (read more: "Nanotechnology inspired by mussels and seashells"). Nacre has a layered structure composed of approximately 95% calcium carbonate (CaCO3) and nearly 5% organics. As depicted in the figure below, single-crystalline calcium carbonate nanotablets (CCNs) are interfaced by entrapped organics. Such a periodic 'bricks and mortar' arrangement is crucial to mechanical and other outstanding properties that nacre possesses. Over the past decades, researchers in this field have devoted significant effort to investigate and mimic such bricks and mortar structures hoping that the understanding on formation of nacreous structure and biological mineralization would lead to new advances in materials technology and related applications. "CaCO3 has long been considered to be a genuine chemical component to approximate nacre," Hua Chun Zeng, a professor in the Department of Chemical and Biomolecular Engineering at National University of Singapore (NUS), tells Nanowerk. "However, only supported polycrystalline CaCO3 (calcite) films have been reported so far by the research community. With rapid advancement of nanotechnology, it would be highly desirable to synthesize freestanding CaCO3 tablet building blocks in large quantities, ideally identical or similar to those in natural nacre, using solution-based methods." However, due to lack of methods to prepare CaCO3 into thin tablet form – i.e., the 'bricks' in nacre's structure – researchers have adopted various structural substitutes which include clay platelets such as montmorillonite, alumina platelets, graphene or graphene-oxide sheets, metal oxide nanosheets, and layered double hydroxides platelets. Now, for the first time, a NUS team led by Zeng has devised a facile chemical method to synthesize single-crystalline CaCO3 nanotablets in large quantities and provided genuine primary building blocks for the fabrication of nacreous inorganic-organic hybrids. Reporting their work in the September 14, 2012 online edition of Advanced Materials ("Calcium Carbonate Nanotablets: Bridging Artificial to Natural Nacre"), the researchers used an effective vacuum evaporation-induced self-assembly method to fabricate films and monoliths with tunable composition and mechanical properties. "The easy availability of CCNs from our present work will allow the design and synthesis of artificial nacre-like materials more relevant to real nacre, and narrow down the huge compositional gap between them." The team's synthesis of single-crystalline calcium carbonate nanotablets started with the preparation of CaCO3 nanoparticles with the assistance of two surfactants in a water-ethylene glycol cosolvent. "We were able to obtain multigram-scale CaCO3 nanoparticles by this low-cost reaction route" says Zeng. "Surprisingly, when the surfactants were removed from the CaCO3 nanoparticles, CCNs could be formed instantaneously." The pristine CaCO3 nanoparticles were only 1–3 nm in size and they were stable for months in mother liquors. To prepare single-crystal CCNs into nacre-like structures, an organic matrix has to be incorporated. Here, the NUS researchers chose gelatine as a gluing matrix. Using these gelatine-modified CCNs, they further fabricated nacre-like CCN-gelatine inorganic-organic hybrids as freestanding films with 10 to 50 µm thickness. Testing the mechanical properties of their nacre films, the largest Young's modulus of 97 ± 4.6 MPa was obtained from a film with from the film with 33% CaCO3. "This is quite comparable with the test data for hydrated nacre obtained by different research groups, which range from 80 MPa to 130 MPa," Zeng points out. So it appears that with the 'bricks and mortar' made from the NUS team's CCNs, artificial nacre-like materials would be closer to natural nacre. Because CaCO3 is nontoxic and biocompatible, such a tablet form of CaCO3 can be used in many existing applications of this material, including calcium supplements, bone substitute, drug delivery vehicle etc. in addition to the nacreous structure which shows outstanding mechanical properties. "Along with the development of biomimetic materials, fundamentally, we anticipate that "bricks and mortar" interaction can be investigated at molecular level with single-crystalline CCNs, because the cations and anions in these newly available building blocks are chemically identical to those in natural nacre," says Zeng. "In addition to assembling hybrid materials closer to natural nacre, the highly oriented CaCO3 single-crystals may also serve as a starting platform for the investigation of CaCO3 and protein interaction. Many fundamental issues in bioinspired materials can be addressed in the near future with this new form of CaCO3 single-crystals." Subscribe! Receive a convenient email notification whenever a new Nanowerk Nanotechnology Spotlight posts. Become a Spotlight guest author! Have you just published a scientific paper or have other exciting developments to share with the nanotechnology community? Here is how to publish on nanowerk.com.